The Canes Earned Their Spot on News 12, But Can They Earn A League Title? On Thursday, January 10th, the undefeated Lady Hurricanes hosted the undefeated John Glenn in a much anticipated match up. News 12 Sports Rush came to cover the game. The News 12 Sports Rush account tweeted asking where their bus should go to cover a girls basketball game. 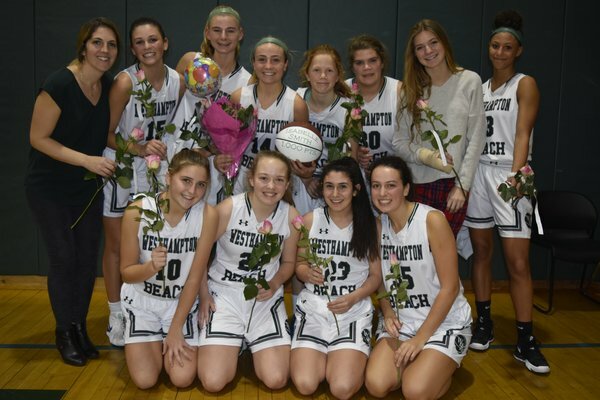 72% of those who votes favored the Westhampton vs. John Glenn game. The Lady Patriots came out shooting, with two three pointers in the first minutes of the game, but the Lady Canes answered back with 15 points to steal the lead, ending the first quarter with the score 15-11. The Lady Canes held onto their lead to finish the first half 29-26 but John Glenn was right there with them the entire time. After halftime, the Lady Patriots began to breakaway with the lead and finish the third quarter 40-43. In the third quarter both teams managed to rack up 30 points, making it the highest scoring quarter. However, the score remained extremely close as each team was putting up points one after the other. The last quarter had all of the fans on the edge of their seats. In the last few minutes of the game, John Glenn’s Samantha Groark shot a three pointer to give the Patriots the lead. Caroline Henke responded with a three pointer for Westhampton, giving the Hurricanes the lead; their first lead since the half. Seconds after, the Hurricanes defense couldn’t stop Groark from scoring another three pointer. She ended the game with a team high of 19 points in the game. However, freshman guard Olivia Rongo answered right back with a three pointer for the Hurricanes to tie the game at 56. The game was looking like it was going into overtime with three seconds left but the Lady Patriots set a screen for Madison Mullman to throw up a three pointer to take the game winning shot, leaving the score 59-56. However, with .01 seconds left in the game, the Lady Canes gave the ball to freshman Molly McCarthy who threw up a deep three pointer from half court but it wasn’t enough to take the win for the Hurricanes. This loss only makes the Lady Canes want to prove themselves in playoffs even more. They are hungry for a league title and to advance in playoffs.